NautiBuoy platforms first won recognition after being awarded a Gold category prize in the prestigious DAME Awards at METS in 2015. A gap in the market was spotted for a multifunctional, easy to use, leisure and maintenance platform that can be linked together in any configuration. accessories to enhance capability. The platforms are seen as an extension to the yacht, so a faux teak finish was added to fit in with the style and lines of any yacht. They are also made incredibly stable due to the unique ballast system that can be manually emptied before retrieval. Due to the modular nature, instead of having one large cumbersome piece of equipment that is difficult to handle and store, the platforms are quick to inflate and deflate (all in under 5 minutes) and can be retrieved and stored with short notice, which comes in very handy when the boss wants to move quickly. For the superyachts and larger vessels, the platforms can be linked together in endless configurations, allowing crew to create beach clubs, Jet Ski docks, tender bays, and long runways and walk ways. The Owners, Captains and yacht crew can customise their own layouts and offer different shapes depending on the activity. 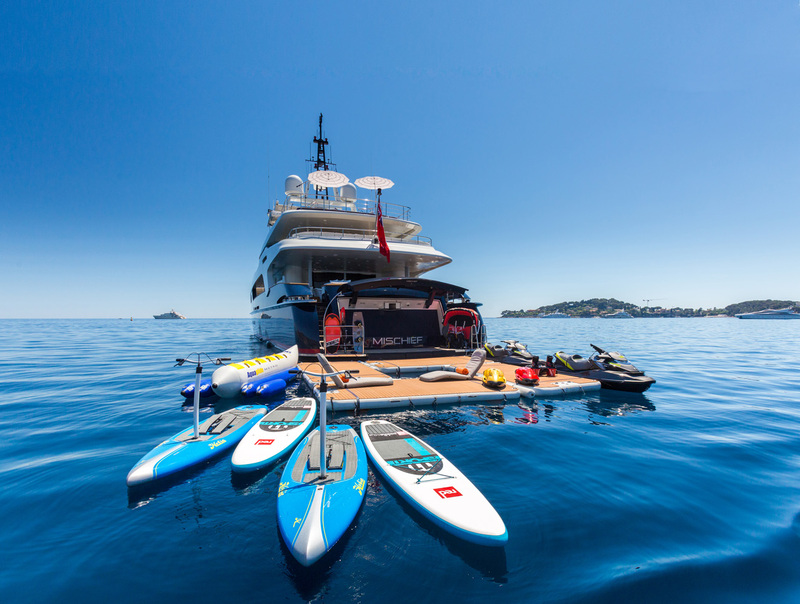 These configurations make the perfect watersports station helping protect the yacht from watersports activity as well as the toys themselves. They make the watersports toys more accessible for the users and allow crew to offer even better hospitality at water level. One of the popular trends for charterers is to charter yachts with ‘beach clubs’ on the stern. Those yachts without the actual onboard space can still create this facility with the addition of the NautiBuoy platforms and docks. On board Mischief we have had 4 of the NautiBuoy Platforms and other accessories for over 3 years now and they are brilliant. We use them for everything; swimming, sun baking, launching the water toys, cleaning the sides of the boat and in particular the safety they provide when docking the tenders and unloading passengers, has proven invaluable. The NautiBuoy platforms act as an extension of our yacht that we use everyday, they are a must have item for any boat big or small. You won’t find better. The smaller yachts also benefit greatly from the platforms as they effectively allow them to have a much more cost effective yacht extension, without the huge costs involved and additional berthing fees. In the relentless pursuit for the perfect solution, the founders designed the platforms to have the ability to transform from a guest ready leisure platform into a solid inflatable maintenance tool. Simply add the lightweight, non-skid fitted cover to protect the platform and your crew can easily clean, varnish, paint, polish and have the hull of the yacht looking immaculate. They can even still link together if needed for those larger yard jobs. The smallest platform can be inflated and launched in under two minutes and with the addition of suction cups with cleats, hose holders and collapsible buckets with lids that attach to the platforms, crew can work around the topsides easily. Gone are the days of having to detail the tender after a full topside wash down. Specifically designed with soft loops and edges, the platforms can sit alongside your vessel for days without you having to worry about any damage. You’ll never have to play “where’s the raft?” in a yard period again. The latest addition to the modular range is the New C-Dock, compatible with F5, F5S and F5SR Seabobs. These are a drive in-Drive out solution that prevents the repetitive lifting in and out of Seabobs from the water. They allow the Seabobs to remain in the water whist being safe, secure and protected. The rib collar style dock, with a ballast bag for stability provides a great training station for new users of the Seabob. They can be used on their own, connected together or connected to the NautiBuoy platforms. 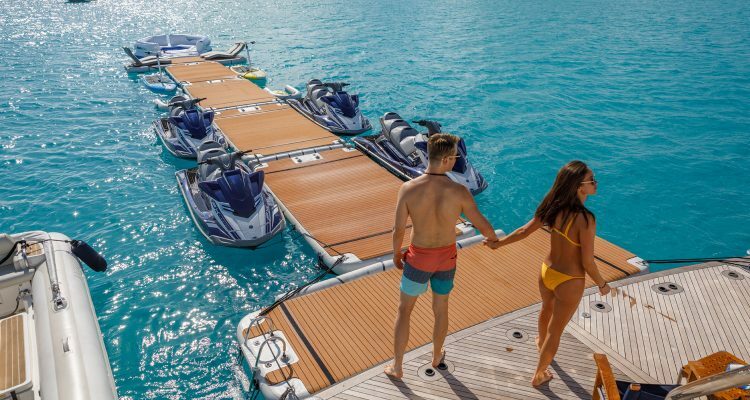 The main ancillary toys of the vessel such as Jet Skis and Seabobs, can now all be protected together in one watersports station, that’s easy to access and right there on the water, ready to go.